In all my years of writing, I would have to say that some of my best writing was done at school. After I had completed my work and had some spare time I would absorb myself in my folder and let all my thoughts spill onto the pages of my notebook. I had a vivid imagination, and along with the bullying I had to endure, I found it very easy to write my poems. In more recent times, I have done my writing on the laptop. It’s usually done when on the bed propped up against a pile of pillows. I find it easiest to write alone, but am able to write when I have company. When I write I find that I sort of switch off and ignore what is going on around me which is why I write alone as I don’t want to be rude and ignore anyone of they’re talking to me and I’m switched into writing mode. School Holidays have just started so now I’m busy keeping the kids amused for a fortnight. I’ve got a few ideas of things to do… not sure what I’ll actually get done though. Time for that appointment with sleep… I have a busy day (well, almost 3 weeks) ahead of me. DP: Riding the roller coaster that is my life. If I had the choice to relive the last week I’m not sure if I would want to do so. There has been illness in the family, early mornings, extremely late nights and next to no exercise. I guess there’s nothing wrong with early mornings; it’s just when they are very cold- that they’re not as fun as they could be. The same goes for the late nights too… well it was in a way an early morning as I didn’t get to bed until after 4am!!! I thought about just pulling an all-nighter but decided it was probably not the smartest thing to do. I used to be able to do it years ago… but I’m the oldest I’ve ever been. Actually, thinking about the whole “Groundhog Week” scenario in a more general view, thinking to all my life up until now- I don’t think I’d choose to live 1 particular week over and over. There have been many memorable moments in my life that I would love to relive again numerous times, but there are also moments that I never even want to think about again- let alone experience again. That’s the thing with life and living… you never know what’s around the corner. You don’t know when your number’s up. It might be now, or tomorrow, next week, next year or maybe not for another 77 1/2 years. We just don’t know. We may as well try to make the most of it, we may as well try and do things that we enjoy as living a tiring miserable life isn’t fun at all. Learn to think like a child again- don’t worry so much. Between Point A and Point B was the Wisteria in full bloom. This might not be the clearest photo, but I was caught up in the moment when I took it. I was walking between my home and my children’s school. 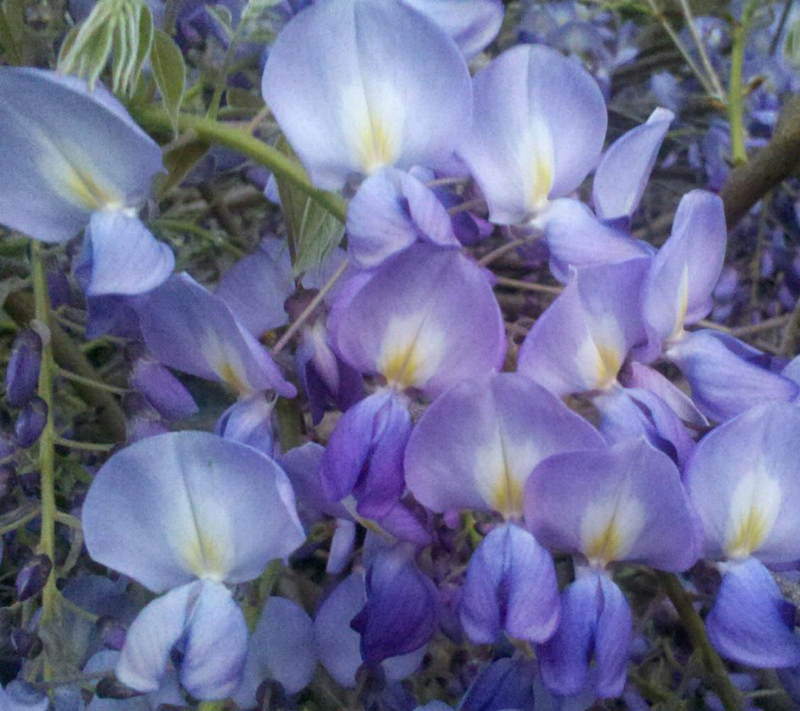 The Wisteria’s beauty took me by surprise. I was having a bad day when I walked by this plant but looking at it’s stunning flowers made my day seem that little bit better.